Why People Believe Weird Things: Pseudoscience, Superstition, and Other Confusions of Our Time is the book I chose to read for my report. The author, Michael Shermer, received his Ph. D. in the History of Science in 1991 from the Claremont Graduate University. He is currently an Adjunct Professor at Claremont, as well as at Chapman University. He is also the Founding Publisher of Skeptic magazine, the Executive Director of the Skeptics Society, a monthly columnist for Scientific American, and the host of the The Skeptics Society’s Distinguished Science Lecture Series ("Skeptic:). Dr. Shermer's own skepticism caused him to look further into people's rather "out there" beliefs. He also tried to determine and explain why people believe such “weird” and easily falsifiable things. The book was divided into five parts, each with multiple sections. The first part discussed skepticism. Dr. Shermer went into detail describing the reasoning behind skepticism, the differences between science and pseudoscience, and the rationale of people’s beliefs in weird things, using twenty-five specific examples of what he considers fallacies. The second part discussed superstition. Shermer discussed near-death experiences, belief in the presence here on Earth of extra-terrestrials, out of body experiences, and many other concepts that he considers to be questionable. The third part discussed the debate between people that believe in creationism and people that believe in the scientific tenants commonly referred to as "evolution”. The fourth part discussed people's disbelief in the Holocaust and other verified historical events and why this sort of disbelief exists. The final part discussed the causes of belief in these doubtful ideas, and why otherwise "smart" people often believe weird things. My favorite section of this book was part three, the debate between creationists and evolutionists. Creationists are also called evolution deniers. They believe in the "supposedly scientific belief system" of creationism (Shermer ch. 3.9). Creationists deny a number of scientifically proven truths and facts, such as evolutionary biology, physics, paleontology, and many other disciplines. Creationists also believe that having a strong belief in evolution causes a person to lose their religious faith (Shermer ch. 3.10). Evolutionists believe in the theory and science that was originally introduced by Charles Darwin. Darwin described evolution as follows: "Organisms change through time. Both the fossil record and nature today make this obvious" (Shermer ch. 3.10). There is significant scientific evidence to back the claims of evolutionists. Creationists conclude that their beliefs, or "creation-science", should be taught in schools as Creationism is based on science (Shermer ch. 3.10). It strikes me, however, as being largely based on religious beliefs. It is interesting to note that this tension between data and fact based science as exemplified by Darwin’s theories, and more faith-based concepts of nature, extended even into Darwin’s personal life, affecting his otherwise close relationship with his wife, who found it difficult to reconcile her husbands’ scientific pursuits with her own strong adherence to her Christian faith. I also enjoyed part three because I could relate to it through both my biochemistry and molecular biology major in school, and my religious background. I grew up in a Jewish household, regularly attending synagogue and religious school. The Bible's telling of the story of creation was recited to me numerous times, to the point where I can recite it from memory. At a young age, this story was all I knew, so I believed it. As I got older, and had entered college with a science major, my beliefs began to progress beyond what I was originally taught. The theory of Evolution, and Natural Selection, originating from Charles Darwin and his work with finches in the Galapagos Islands, was the first material covered in my first semester of general biology. My professor spent considerable class time discussing this theory with my class. We read different publications in order to gain a deeper understanding of Darwin’s thinking. We also read publications made by creationists that would argue the evolutionists claims. After learning about the theory of evolution, I began to believe in scientifically derived and proven fact, and I was able to incorporate those new understandings into a more nuanced view of my own religious beliefs. Now, as a senior approaching my graduation, my scientific knowledge has expanded. In my view, the evidence supporting the theory of Evolution and Natural Selection is obvious and irrefutable. It is remarkable to me that the debate even persists. There is no such evidence backing the theory of Creationism. I am reminded of Galileo as he sat in his house under house arrest because the Church powers of his day were too frightened and hide-bound to accept the obvious truths about the solar system that he and others described and proved. It seems easy to me to have both my spiritual life and my rational beliefs live peacefully, side by side within me, and not at war one with the other. In this course, we learned about the differences between the science of psychology and pseudoscience. This was covered in chapter 1 of the textbook. The science of psychology utilizes the power of systematic, rational investigation to gain knowledge about behavior and mental processes through the collecting of data and the testing of theories and hypotheses through systemic empiricism. Systemic empiricism aims to rule out any and all alternate observations that try to describe the phenomena being tested. Through the use of publicly verifiable knowledge and experimentation that can be verified through repetition, understanding is advanced. After a psychologist’s research is performed, the data developed is shared with the rest of the scientific community. This allows for peer review, the opportunity for other scientists to review the research and its findings, or even to perform their own experimentation to repeat the research under review, or even devise new tests of the phenomena being studied. If the original results are never duplicated, the original study could be seen as a "fluke" and will hopefully not be published in any scientific journal. If a research question cannot be answered and cannot be tested with available research technique, it is considered to not be within the purview of today’s available science (Lawson 2-3). Pseudoscientists sometimes seem to use certain words incorrectly or illogically. Unlike mainstream sciences, which regularly progress over time, pseudoscience does not advance in a generally accepted form, due to the fact that its intellectual product does not undergo a formal process of rigorous testing and peer review. Instead of conducting experiments to prove or disprove a claim or theory, pseudoscience relies on personal experiences and testimonials. Pseudoscientists appeal to "authorities" that may have little expertise on the subject in question. They also tend to make claims that cannot be supported by verifiable evidence. Such claims often conflict with traditional scientific understandings that have developed over centuries of painstaking research and verification. Human limitations are routinely overlooked. Pseudoscientists tend to seek out and rely heavily upon information supportive of their beliefs, and whose accuracy may be in doubt (Lawson 3-6). Evolutionists often have difficulty relating to creationists. The groups contrast through their fundamentally different approaches to a given topic, as well as through their differences over each group’s ultimate aims and goals. Heated debates have raged, from the famous Scopes trial of a century ago, to today’s struggles to formalize creationism in some school districts in the United States. Why People Believe Weird Things: Pseudoscience, Superstition, and Other Confusions of Our Time went into great detail in describing both points of view. Although it is very hard to change a person's beliefs, this book could help people see that there are truly two sides to every story. By listening to opposing views, actors might be stimulated to re-examine their own beliefs. Politics in America today reflect this divide as religious belief has once again injected itself into our nation's politics. Books such as Why People Believe Weird Things may help create a bridge between the two camps. This book also shed light on the true reasons people believe “weird” things. Typically, people that believe weird things are viewed as being crazy or uneducated. The reasons for individual belief sets may be more complex, combining upbringing, education, religion, and milieu. By reading this book, skeptics may have a better understanding of why people believe weird things. Skeptics may try to understand these people's beliefs and have a broader view of certain competing claims and theories. 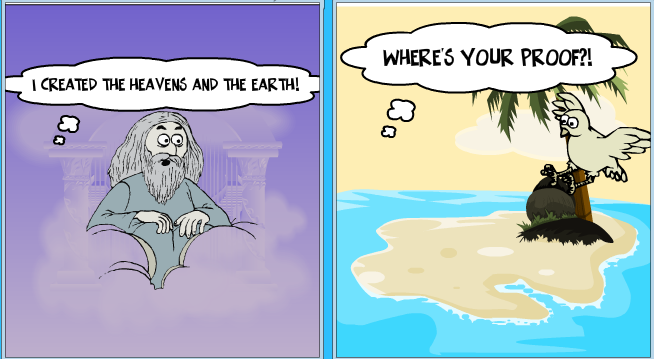 For the creation portion of my report, I created a comic of G-d in heaven and a finch on the Galapagos Islands fighting about creationism and evolution to represent the fight between creationists and evolutionists. Lawson, Timothy J. "What Is Pseudoscience?" Scientific Perspectives on Pseudoscience and the Paranormal: Readings for General Psychology. Upper Saddle River: Pearson Education, 2007. 1-10. Print. Shermer, Michael. Why People Believe Weird Things: Pseudoscience, Superstition, and Other Confusions of Our Time. New York: W.H. Freeman, 1997. Kindle file. "Skeptic: Examining Extraordinary Claims and Promoting Science." Skeptic » About Us » Meet Michael Shermer. N.p., n.d. Web. 10 Aug. 2014. <http://www.skeptic.com/about_us/meet_michael_shermer/>.